Recently, the Watertown Police Department (Watertown, S.D. ), constructed a new building. When it came time for new signage that will complement the new structure, they chose a custom monument sign created by Signs By Benchmark from its cellular plastic medium. 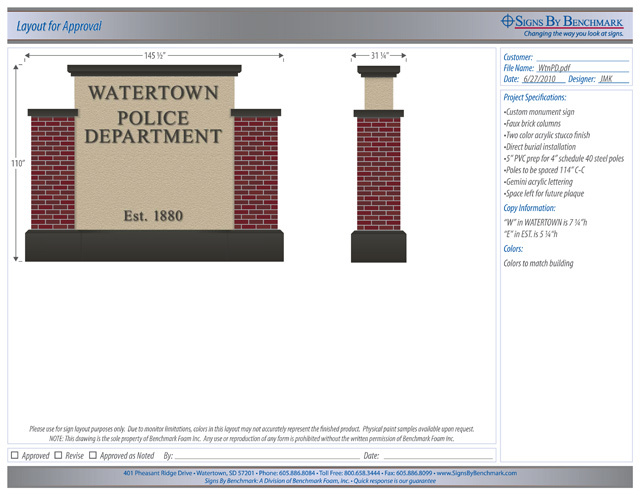 Because the sign will be installed very near the facility, the main design concern was that the faux brick columns exactly match the existing brick of the building. To achieve this, precise brick and grout measurements were recorded. Color matches were obtained by holding matching paint chips to the brick and grout under good lighting conditions while photos were taken with a digital camera capable of producing high-quality photos. 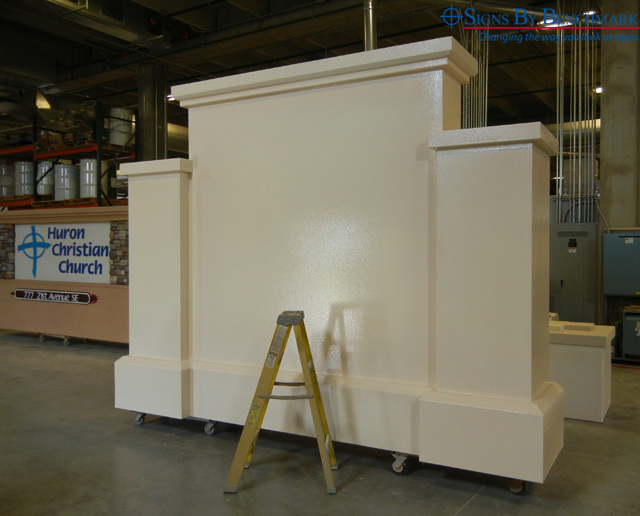 The stately 12′ 1 1/2″ high x 9′ 2″ wide x 31 1/4″ deep custom monument will feature a two-color acrylic stucco finish, Gemini acrylic lettering and space where a plaque will be mounted in the future. Over the years, the skilled Signs By Benchmark team has become extremely expert at matching existing elements when creating faux brick components. Give them a call today at 605-886-8084 or 800-658-3444 to discuss your upcoming projects. Their experienced knowledge and the flexibility of their cellular plastic medium can help you turn your ideas into reality! To view photos of some Signs By Benchmark signs and sign accent components (bases, pole covers and tops), click here. To view videos of how Signs By Benchmark creates their products, click here. To read, download or print Signs By Benchmark brochures, click here. Need a sample of Signs By Benchmark’s products so your sales staff can provide customers with a hands-on experience? Click here to learn how to obtain a Sign Demonstration Kit.